Everyone’s been cracking on about how fantastic and magical the beginning of their 2015 has been. But I’ve been off work, too darn poor to go out – or plan any trips for the near future. But in the meantime, I’ve been keeping busy by teaching myself some new tricks. 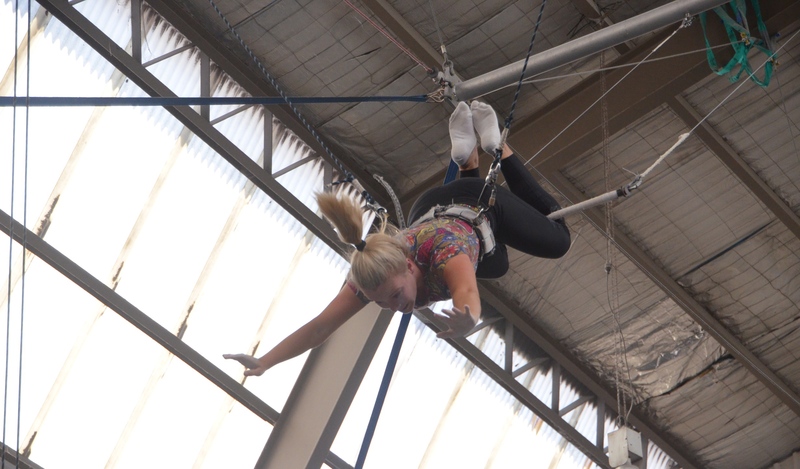 The other day I learnt how the circus folk do their cool tricks and stuff at the Sydney Trapeze School. It’s in this giant warehouse in St Peters where rope, giant ribbons, olympic rings, floating platforms, enormous nets and hoola hoops are strung about, with tiny athletic and super acrobatic flexible people carelessly wander around. If you aren’t put off as you sit and watch the professionals stretch – with their faces almost touching the ground between their split legs, and their bodies folded in half as they ‘warm up’ – then maybe you’ll be put off when they teach you the basic steps of ‘how to hang upside down from a trapeze 20 feet above the ground’. They lined us all up in front of a beginners test trapeze, where the bar was only 2 metres off the ground, or a hand stretch above your head. Some of us were unfit, some were young and I stood there with my uncoordinated limbs shaking with fear. 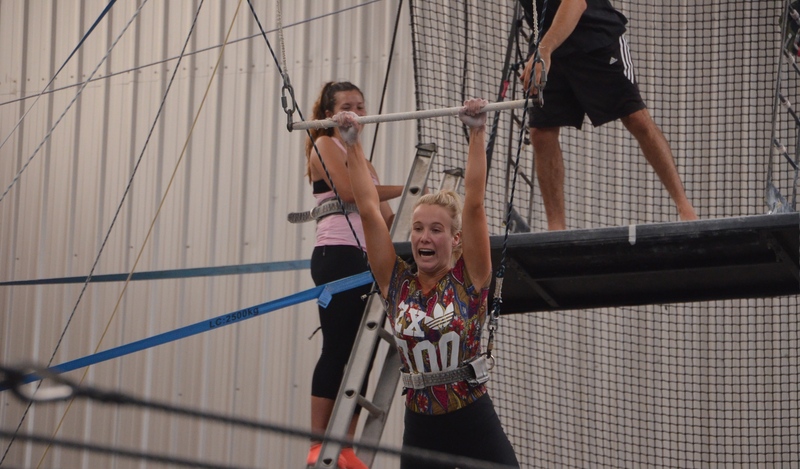 The instructor pulled us up one by one, and made us practice hanging off the bar, swinging the back of our legs up onto the bar, and then letting go and hanging upside down. 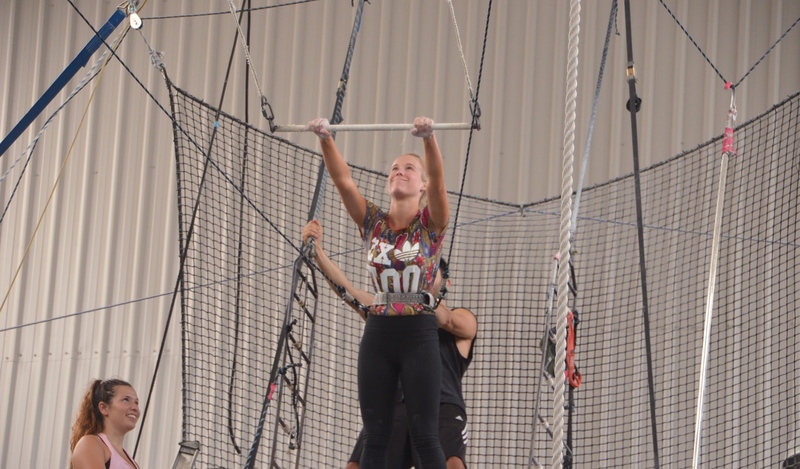 When it came to my turn, I grunted and mumbled sarcastic things under my breath as the instructor helped me dangle upside down before the others. “That wasn’t actually that hard hey!” I confidently said as I walked back into the line. Next, it was my dear friend Alyssa’s turn. As she swung her legs over the bar, her bright pink undies shone through her misleadingly black tights. Nobody said a word. As she hopped back down, she saw the mortified look on my face as I telepathically told her that her pants were see-through. But see-through tights was the least of our worries. Because next, we were going to perform the real thing. Two ladders taped together led us up to a floating podium that was somehow magically suspended in mid air by some strong wire that was attached to other nooks and crannies of the warehouse. Right. You see that is where I encountered a little problem. I have this problem where I hate following orders. So when somebody tells me to jump, I’m all like, ILL DO IT IN MY OWN TIME. But in this case, I really had to listen to the instructors and do as they said. Mildo: OOOH NO. OOP. NOT YET. Instructor: Okay, next one. Ready? HEP! So as you can probably tell, on the third ‘hep’ I jumped. Or slid off… I’m not too sure. As you can see above, I’m looking heaps enthused about flying towards the net. Here’s some dialogue between my limbs and my brain that went on at this point. Brain: So the instructor said to loop your legs over the bar when you get momentum. After the first go, I got a little less scared and did as I was told by the instructor. Each time we went, we were taught how to make our technique a little better. And on the last go, one of the professionals grabbed my wrist when I swung towards him, and we did the double trapezey thing. I highly recommend all you dare-devil-adrenalin-seeking-fun-people give this place a try. I give the thrill factor a good 16/10 and the adrenalin factor a fair 9/10.